Annual Data Scaled geometric mean of young-of-the-year striped bass per seine haul in the primary nursery area (index stations) by year. Vertical bars are 95% confidence intervals as estimated by + 2 standard errors of the mean. Horizontal lines indicate historical geometric mean (solid) and confidence intervals (dotted) for 1967-2011. Graph courtesy of Leonard Machut/VIMS. Juvenile Striped Bass Four of the 408 young-of-year striped bass collected by the seine survey in 2012. These fish generally measure between 40 and 100 mm (1.5-4 inches) in length. Photo by Leonard Machut. Seine Net Patrick Link (L) and Leonard Machut (R) begin to deploy a seine net on the James River as part of VIMS Juvenile Striped Bass Seine Survey. Seining Caitlin Smoot (background) finishes a seine sweep at a York River sampling site as Virginia Zakrzewski (foreground) prepares to help in hauling the net out. Photo courtesy of Leonard Machut. Juvenile Striped Bass Technicians Virginia Hewitt (L, with an Atlantic croaker) and Robert Fitchett (R, with a puppy drum) display some fish that were commonly caught in 2012. The fish were collected from the York River. Photo by Leonard Machut. Typical Catch A typical catch contains fish such as white perch, striped bass, blue catfish, and gizzard shad. On average, the survey identifies approximately 65 different species of fish per year. This catch is from the James River near Jordan Point. Photo by Leonard Machut. Processing Samples Members of VIMS's Juvenile Striped Bass Seine Survey count and measure young-of-the-year fish following a net haul on the James River in 2011. From L to R: Caitlin Smoot, Virginia Zakrzewski, and Leonard Machut. Preliminary results from a long-term survey conducted by researchers at the Virginia Institute of Marine Science suggest poor striped bass production in Virginia tributaries of Chesapeake Bay in 2012. The 2012 year class represents the group of fish hatched last spring, which will grow to fishable size in 3 to 4 years. Poor production was also reported in 2012 for the upper Bay and its tributaries in a sister survey conducted by the Maryland Department of Natural Resources. VIMS’ Juvenile Striped Bass Seine Survey recorded less than 3 fish per seine haul in 2012; significantly lower than the historic average of roughly 7 fish per seine haul. This is a notable decrease in annual recruitment when compared with recent years in which catches of young fish were rated average or above average. Just last year in 2011, an exceptionally strong year class was produced in Virginia waters. Year-class strength was also high in 2011 in Maryland and North Carolina. Striped bass play an important role as a top predator in the Chesapeake Bay ecosystem, and provide value to numerous commercial and recreational anglers. Fabrizio notes that the economic and ecological value of striped bass lends significant interest to the year-to-year status of their population. "By estimating the relative number of young-of-year striped bass," she says, "our survey provides an important measure of annual and long-term trends in the Bay's striped bass population." The VIMS Juvenile Striped Bass Seine Survey currently samples 18 stations in the Rappahannock, York, and James rivers. 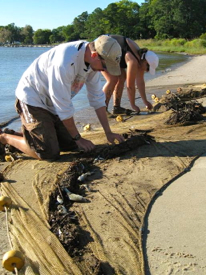 Each year, biologists sample each site 5 times from early July through mid-September, deploying a 100-foot-long seine net from the shore. They count each netted fish, measure its fork length (the distance from snout to the fork in the tail), and return it to the water. These young striped bass generally measure between 1.5 and 4 inches long. Survey scientists measured 408 juvenile striped bass at these stations in 2012. VIMS has been conducting the survey annually since 1967 for the Virginia Marine Resources Commission (VMRC). The Bay's striped bass population has rebounded from historic lows in the late 1970s and early 1980s, following fishing bans enacted in Delaware, Maryland, and Virginia in the mid- to late-1980s. Since then, the Bay's striped bass population has increased to the point that striped bass are now considered recovered. The recovery of striped bass in the early 1990s can be partially attributed to a few strong year classes produced in the late 1980s. Monitoring of juvenile striped bass recruitment will continue next year to provide managers with crucial information to sustainably manage this sentinel Bay species. “We’re eager to see juvenile striped bass recruitment bounce back to near average or above average conditions in 2013,” says Machut.